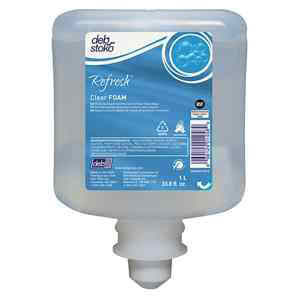 Catalog: Refresh™ Clear FOAM 1 L. 6/Case. Refresh™ Clear FOAM 1 L. 6/Case. Made for frequent use, this perfume-free and dye-free foam hand wash contains skin conditioners to improve skin hydration and prevent drying. Rated NSF E-1 rated for food handling environments. 1 L. 6/Case.